Yesterday I presented a recipe for Spicy Creole Shrimp Dip for your Superbowl enjoyment. Now, some people have a preference for crab over shrimp and, to be fair and impartial, here is your crab option from the same excellent source: Acadiana Table by George Graham. It’s a Louisiana man giving you Louisiana recipes. His suggestion is to serve this with strips of sweet peppers, but I think this will mate perfectly with crackers or small pieces of toasted bread. Even small pieces of hot garlic bread. Enjoy the game. And the food and beverages! Oh, the picture versus the recipe. 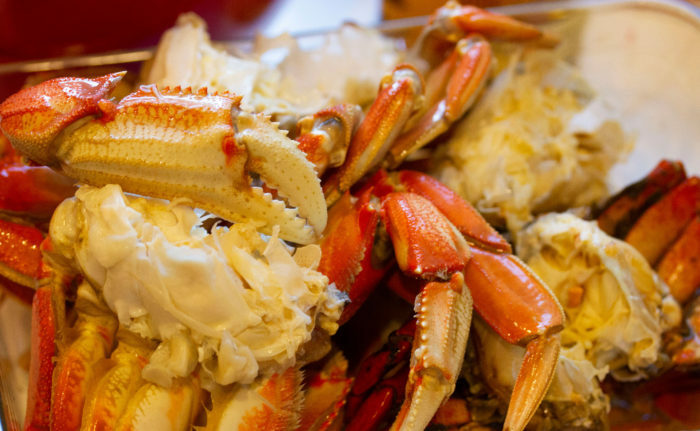 Yes, you could just buy a can of fresh crab meat. But, let’s assume your favorite team did not make it to the Superbowl. Like my Chargers. Still angry? Well, buy a whole crab or more, get a hammer, and take it all out on the crab. The crab is dead, so it won’t feel anything. But, you’ll have emotional relief and really fresh crab meat. And, lastly, instead of using this as a dip. You can use it as a topping or filling. Put it over lettuce or fill up an avocado half. Go ahead, be crabby. I am. I have to wait until next year. Again. Whisk the cream cheese and mayonnaise in a bowl until blended. Add the onions, celery, green onion, parsley, thyme, lemon juice, hot sauce, and Cajun Seasoning Blend, and stir. Add the crabmeat and stir to incorporate evenly. Season to taste with salt and pepper. Taste again and adjust with more hot sauce if you like it spicy. Cover the bowl and chill to allow the flavors to work together. Serve with fresh sweet mini peppers for dipping.